Union Poitiers Basket 86 (ProB) added to their roster 30-year old Ivorian international swingman Guy Landry Edi (202-99kg-88, college: Gonzaga, agency: Promotex). He started the season at Kataja in Finnish Korisliiga. In 7 games he recorded 6.7ppg, 3.1rpg and 1.6apg this season. Edi also played 4 games in FIBA Europe Cup where he averaged 7.8ppg, 5.8rpg and 1.0apg. The most of last season he spent at Hermine Nantes Atlantique. In 33 ProB games he had 10.7ppg, 4.4rpg, 2.0apg and 1.0spg. Edi also spent pre-season at Saint Chamond earlier that year. The list of the past achievements is quite long as among others his team made it to the ProB Play-Offs Semifinals in 2014. 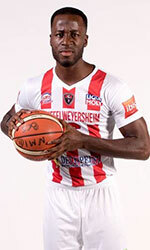 Edi was also voted Africabasket.com All-African Championships 2nd Team back in 2011 at his college time. 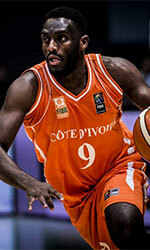 Edi represented Ivory Coast at the Afrobasket Championships in Abidjan (Ivory Coast) six years ago. His team got to the Semifinals and his stats at that event were 7 games: 4.7ppg, 2.6rpg, 1.3apg. Edi has played previously for two other French teams: Chalons Reims and STB Le Havre. He attended Gonzaga University until 2013 and it is his sixth season as a professional player.